Weedy waters can present many issues, not least of which is finding a spot where it is possible to effectively present a baited rig. More often than not a bit, or a lot of casting around will reveal somewhere where I can get a lead to touch down. Occasionally though I need to consider something else. In weedy conditions fishing close in gives me a more realistic chance of landing fish, but what if the only drops I can find are some way out? 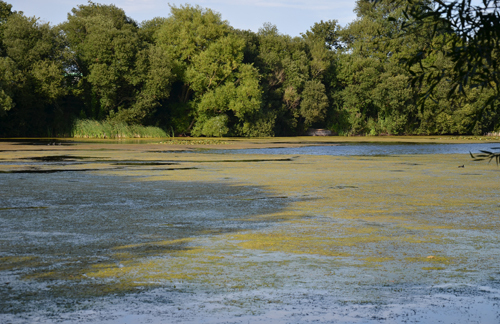 The weed may be covering the water’s surface or the only hole in it is too far from where the fish are holding up. In these situations I break out something that, although only used occasionally, has been extremely useful – a weed rake. 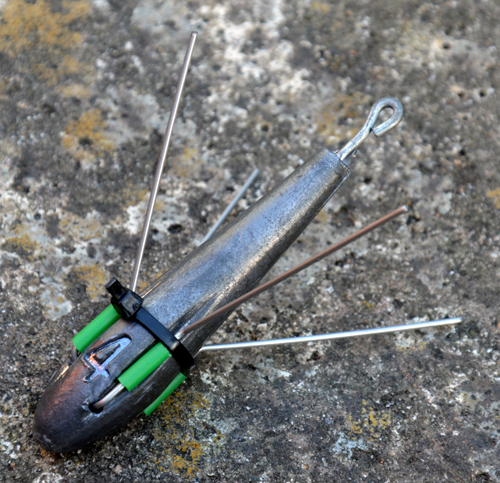 This simple little item has helped me bank some special fish over the last few years and is an essential part of my kit. Although its primary purpose is for clearing spots on which to present a bait, it has proved invaluable in a number of scenarios. Uprooted rafts of floating weed are something I have had to deal with on a couple of waters that I fish and it’s not uncommon to be wiped out by them as they drift around at the mercy of the wind. They sometimes settle between me and the area I am casting to which prevents me getting my line down. The weed rake can be employed to remove these, enabling me to fish a swim that other anglers are unable to. Marginal bands of weed that would make netting fish next to impossible can be taken out, as can snaggy branches that have fallen in and could lead to a loss. I’ve even used it to rake off marginal gravel patches, just to ensure that there are no twigs that could ruin a delicate presentation where the Carp are likely to be extra wary. Constant handling of clumps of weed softens the skin on ones fingers so, to prevent the braid from cutting through to the bone, a thick nylon leader is advisable. 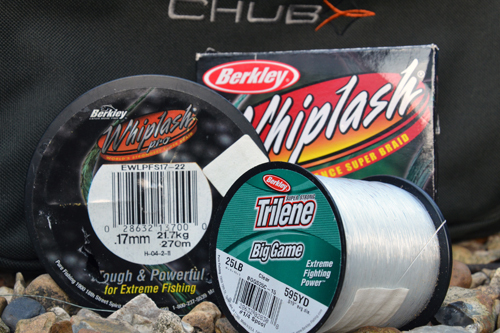 Twenty feet of 25lb or 30lb Berkley Big Game is nice and thick and stands up to the abuse well but it should be checked regularly for any nicks and abrasions caused by snags, mussels etc just to be safe. I finish off with a short length of lead core to give the ultimate protection to the most vulnerable part, the end. So in a typical scenario, let’s say there is a fish basking in the weed nearby. By casting around with a bare lead, I’ve identified an area where the weed is lower or less dense – an area where I can feel the lead descend through the water column but doesn’t reach the bottom. How do I go about clearing the spot to enable a rig to be fished with a fair degree of assurance that it will be fishing effectively? I don’t want to clear a massive area, just a spot wide enough to present a rig on but long enough to get some of my line down. It’s best to begin at the nearest point otherwise you’ll end up with a huge immovable mass to shift. Clipping up on the reels’ spool keeps everything accurate and then, after a few casts I’ll let out a couple of feet and re-clip, working towards the back of the area. You’d think that chucking a big lead about and winching weed across the surface would have any Carp fleeing to the opposite end of the lake but on the contrary it often seems to attract them. Carp are inquisitive creatures and can often be seen investigating the disturbed area an hour or so after the job is completed. In fact, on a couple of occasions I’ve had to hold back from casting the rake out for fear of hitting fish that are exploring the disturbed area as I’m raking. Even if the raking does disturb them they don’t usually go far. In heavily weeded parts of the lake spooked Carp tend to bury their heads in a weed bed as that offers them the best security. They soon re-emerge when the disturbance has died down and they are usually content to go about their business as if nothing had disturbed their world. I’d err on the side of caution though and confine my raking activities to those hours when a bite is unlikely. 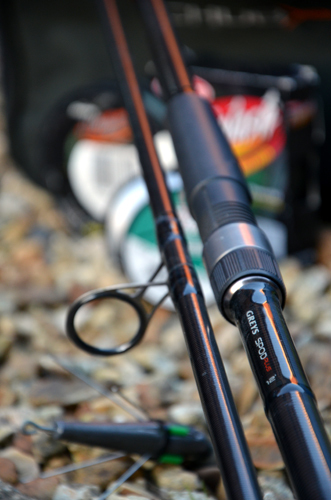 Rake for long enough and you’ll be able to put a bottom bait out, just take a bit out and lay a chod over the remaining low lying stems or somewhere in between. It’s entirely up to you how clean you want to make the lake bed. 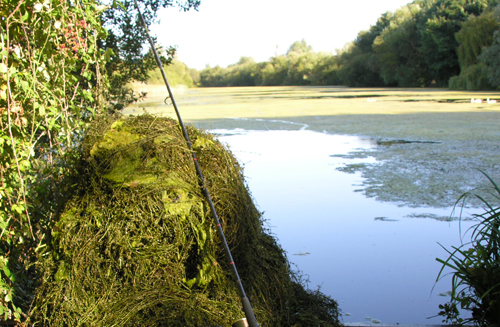 Bear in mind though that the more weed you remove the easier it will be for other anglers to find and capitalise on. 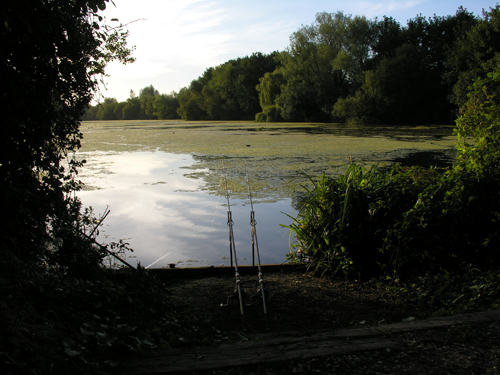 When you think about it the consequences of clearing a spot can prove very attractive to Carp. The action of dragging weed up from its roots will cause some clouding of the water, which will draw their attention. Then there is the plethora of little natural food items such as shrimps, larvae, mussels etc that are suddenly available -shaken free from the weed and with nowhere to hide. Any bait can be introduced immediately afterwards although small bits and pieces (chops, pellet, hemp, etc) will echo the abundance of naturals nicely. Whatever you use it wants to be kept tight. There is little point in cleaning up the bottom to mimic a feeding spot and then spreading bait around all over the show. The area will still have the odd broken piece of weed stem floating about which will take a while to drift off. By waiting for a while before casting out you can be confident that your rig won’t have caught up on one during its decent. The usual angling etiquette should be applied though. A couple of drags in the margins won’t affect anybody else but thrashing the water to a foam close to or opposite someone isn’t going to make you any friends. Raking activities don’t have to be confined to during your session, particularly if you are worried about it spooking fish. Why not clear a couple of spots a few days prior leaving your swim primed and rocking, awaiting your arrival? You could prepare several swims during the closed season if your venue has one giving you a distinct advantage over those that don’t know where your spots are. It takes on average in the region of a couple of hours graft to clear a spot, which, over a two or three night session, isn’t really that much is it? It can in fact, take less time to make your own spot than to find a naturally occurring one. Effort in this sport is often rewarded and nowhere is this more evident than on weedy waters. It’s no coincidence that the anglers that put the work in are the same ones that seem to catch the most fish. Raking is something that is only applicable in certain circumstances, but in those specific situations taking the time and trouble it is well worth it. 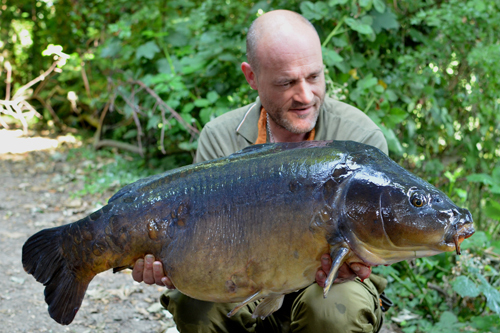 This entry was posted in Techniques and Methods and tagged carp fishing, matt eaton, weedy waters. Bookmark the permalink.